It is no secret that music moves me to tears. So does dance. And the sound of the ocean. My father bought our first piano out of the officers' mess when I was maybe 5 years old. It was a black lacquer baby grand patterned with the rings from years of wet mugs of beer set on its top. The gilded soundboard was stained and slightly warped from spilled drinks, irreparable but not un-beautiful to the child I was. My lessons were tedious when I would lay under the piano as if inside its very bones and listen to my father's reel-to-reel recordings of Mozart, Ravel, Dvorak, Smetana, Tchaikovsky. Even as a child I could weep at the rise in Rachmaninoff's Symphony #2, the 1812 Overture, or Horszowski's Beethoven. 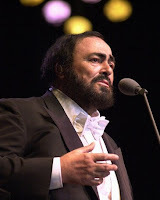 Pavarotti's nessun dorma still brings me to my knees. Mahler remains my muse. But the first song I ever performed myself, outside of Sunday School learning and John Jacob Jingle-heimer Smith (sp?) was Glen Campbell's Rhinestone Cowboy. My parents recorded the performance, perhaps for some future opportunity for blackmail. My sister and I couldn't have been more than 8 and 9. We knew all the words to every verse and performed in an acapella disaster that climbed with every stanza to reach a piercing falsetto by the final line. The recording is stunning, and, hopefully, lost. I was also a nun once. My friend Barbara Hanson and I were juniors in high school, walked down the auditorium aisle together with candles and the women's choir, Ave Maria in full black and white habits for the Sound of Music. Hang on to that visual through the rest of my personal history. I remember singing all the words to Rhinestone Cowboy! Ha. And isn't it funny, my Bree is a nun in this year's version of Sound of Music at VSAA. Loved your description of the piano and emotion surrounding it. Thicker Than Water is Editors' Choice!